MONACO — Max Verstappen is struggling to keep his Formula One season on track. The 20-year-old Dutch driver finished last season so strongly that there was talk he could challenge for the F1 title this year. But so far he is drawing attention to himself for his mistakes more than anything else. So far Verstappen has one podium heading into Sunday's Monaco Grand Prix — the sixth race of the season. He has already failed to finish two of them, and will now start on Sunday from the back of the grid following another high-profile incident. 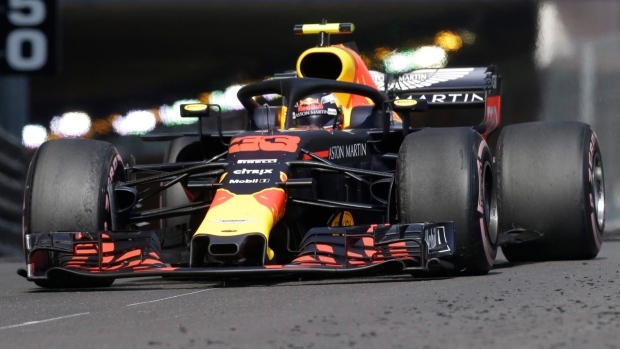 Verstappen didn't even make it into qualifying because he shunted his Red Bull into the barriers toward the end of the third and final practice earlier Saturday. He was topping the leaderboard and under no pressure, yet made an error eight minutes from the end of P3. Veering out of the swimming pool section next to the famed harbour, he slid across the track and slammed into the barriers. "I got a little bit caught off guard passing, which isn't an excuse," Verstappen said. "It happened so quickly after getting a bit distracted and perhaps I turned in a bit too early. Like in China, this was my mistake." Red Bull could not repair the badly damaged right side of his car in time for qualifying. The team also had to change his gearbox because of an unexpected leak — meaning a five-place penalty, made irrelevant by the fact he is starting last. By contrast, his teammate Daniel Ricciardo starts in pole position. "We need to push it but we don't need to overdrive it," Ricciardo said on Verstappen's crash. "Just hit your marks and keep it clean." While Verstappen congratulated Ricciardo on his fine drive, he felt bad about letting down the team. "It was a small mistake that resulted in us paying a big price," Verstappen said. "That is usually the way in Monaco." Two years ago, Verstappen also started from the back here after a similar mistake in qualifying. Red Bull boss Christian Horner sounded annoyed with Verstappen — and not for the first time. "He needs to learn from it and stop making these errors. He knows that more than anybody, and I would imagine that was a pretty painful qualifying for him," Horner said. "He's a phenomenally fast driver and would have been able to be competing for the pole position today. For the whole team to only be running one-legged with such a strong car is frustrating." Verstappen is regarded as F1's next big star, with observers united in designating him a future multiple-champion. He was the youngest race winner — at the age of 18 — but is now getting into the spotlight for different reasons. Vettel saw his chances of a podium ended at the Chinese GP last month after his Ferrari was clipped by Verstappen. Then, at the Azerbaijan GP last month, Verstappen had Ricciardo right behind him with a podium finish in sight for both drivers. Verstappen's ferociously aggressive defence of his position ended when Ricciardo went into the back of him and both crashed out of the race. It was not all Verstappen's fault, as Ricciardo might have shown better judgment himself that day, and both were sternly rebuked by Horner. But it just seemed all too predictable that it would happen.